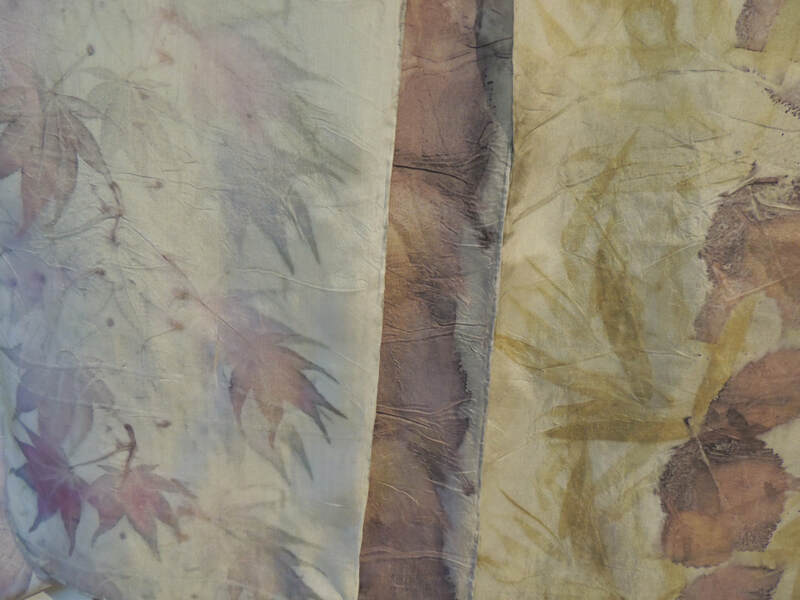 I am working more into sculptural aspects of using natural materials such as kelp and fine willow. 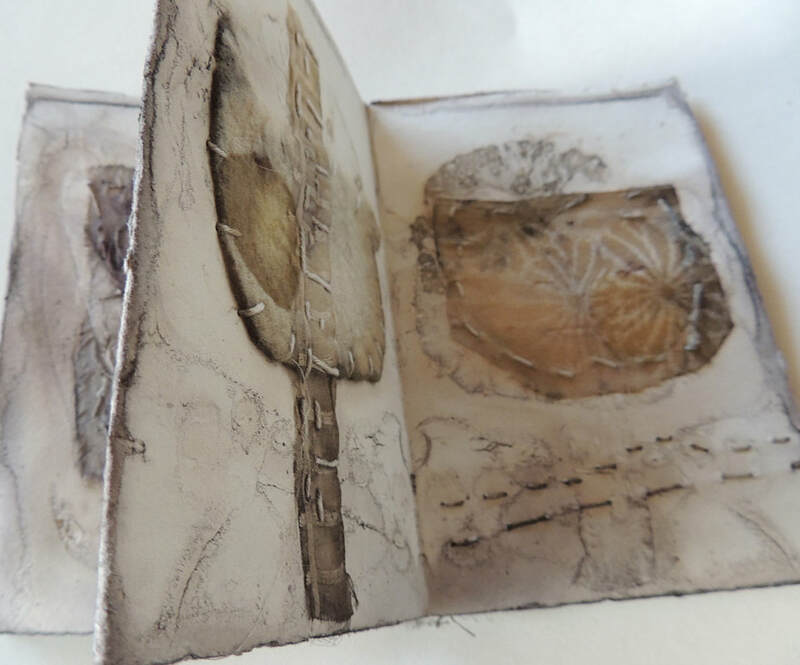 My intention is to produce an installation made of three large cocoons embodying some of the reoccurring themes in my life as I continue to be a traveller in this land and time. For this proposed exhibition in 2019 at the Haida Gwaii Museum, I plan to work with the concept of cocoons. I have been drawing and studying the shapes of cocoons for a long time considering how they might function as symbols and what they may evoke. I spend many hours in my studio exploring materials. Currently I am thinking about making one of layers of onion skins, one woven of bull kelp and another focused on paper perhaps records used for identity. I will be taking a five day workshop with Mo Kelman a sculptor from Rhode Island beginning of November where I will be exploring techniques and also elastic type materials. 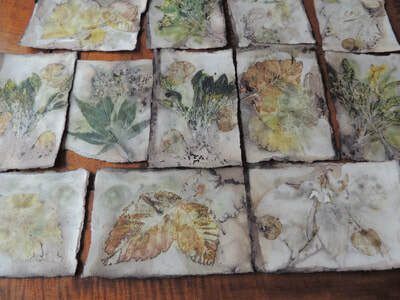 Having had a lifelong interest in natural textiles I was delighted to attend a Five day workshop by India Flint of Australia using natural plant materials for dyeing without Mordants or chemicals. I was especially interested in dyeing paper. I travelled to Australia in late July making my way by plane to Darwin. From Darwin we travelled two full days to Marparu in the Northern Arhem land by road , sleeping on the ground under the stars. 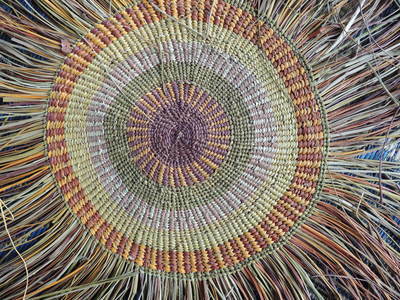 I participated in a 10-day weaving and cultural immersion with three generations of traditional Aboriginal weavers. Their knowledge has been passed down from mother to daughter and granddaughter for generations. 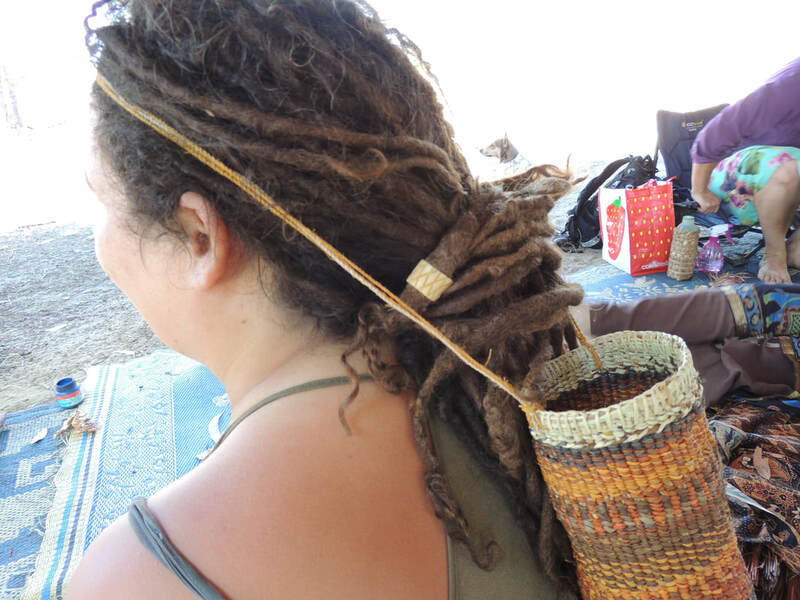 Historically, baskets were often the only belongings carrying these peoples’ stories, knowledge, language, law, and even mens and women's power. 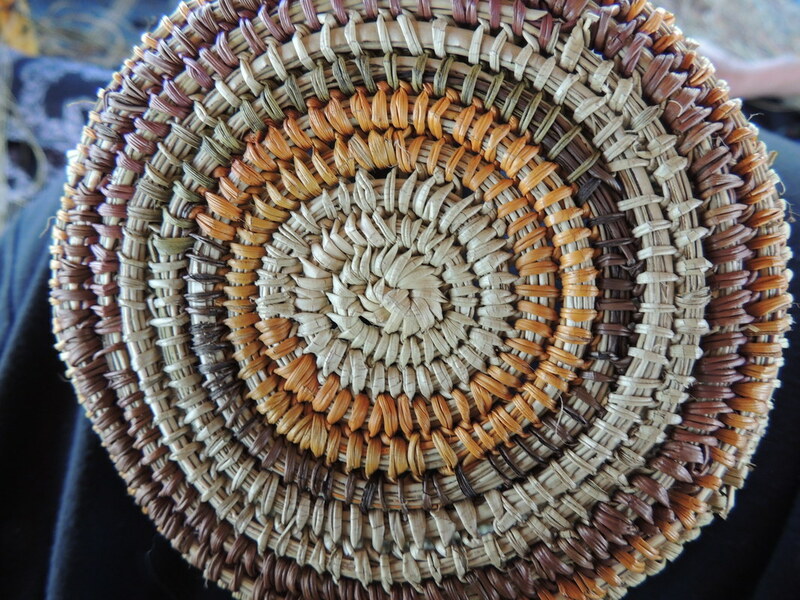 I chose Australia because of their fine grass weaving and although not documented there is aboriginal connections many generations back in my family. There is a large weaving shelter built of bark strips between the womens camp and where we pitch our plethora of little tents. We are assigned a mentor, mine is Rosalyn. We are expected to sit and watch, then weave as well learn some of the language. She then starts a project and hands it to me. 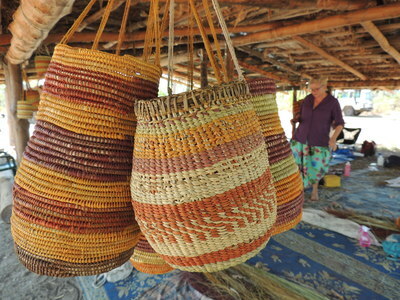 We are using pandanus a traditional material dyed with natural plant dyes. All in amazing earthy tones. 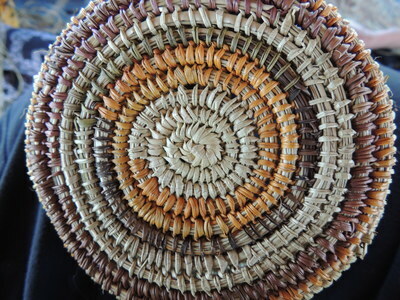 I try a round basket coiled basket which is stitched with a blanket type of stitch using the pandanus. The last week I went out hunting we collected mangrove worms from the mangrove swamps near the sea they seem to be a great delicacy you squeeze the sand from them and eat ,they taste like raw clam. Keeping a watchful eye for Mr Crocodile. This last week I made a twined pandanus dilly bag with Kurranda string. Bark is gathered from the Kurranda tree and twined by rubbing it on your thigh. All the older women have calluses on their thighs. I also meet with a senior Curator, Lindy Allen who specializes in fibre at the Melbourne Museum and she showed some of the amazing collection of thousands of baskets they have catalogued. 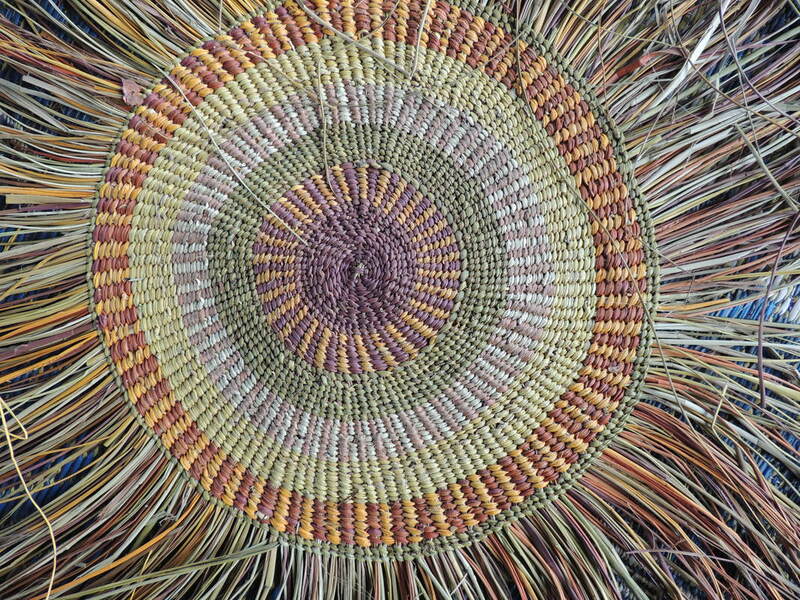 My interest in first contact and that influence was renewed and I will continue my studies on indigenous weaving The Melbourne museum also has a garden of grasses and plants used in indigenous weaving so I was able to see the plants and think about what we have locally.